Just before the closing ceremony of the Paralympics I went and sat out on the main Olympic concourse, with a box of fish and chips and a drink and watched the world go by: the waft of fried food, the buzz of the crowd, the colour, sound, anticipation, it was all there. The closest I can get to that spot today is about 400 metres away, behind a railing in a safe walkway area. No need for shades and a baseball cap to keep the sun out of the eyes. It is fleecy hat and gloves weather, the T-shirt has been exchanged for a high-visibility jacket, the deck shoes for steel toe-capped boots and I have got a hard hat in my hand. The site looks hauntingly like it did in 2010, two years before the Games. Instead of the Riverside Arena, there is a muddy bowl, a digger where the blue and pink "smurf turf" hockey pitch used to be and the technicolour kaleidoscope of humanity has been replaced with a monotone wasteland of construction work. Nothing feels or looks the same as it did in the hours before the Games' opening ceremony last July, but the permanent structures help with orientation. 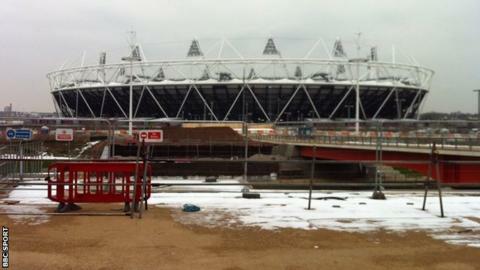 To my far left, there is the Aquatic Centre, Orbit and Stadium. Behind me the Velodrome, opposite lurks the pragmatic grey oblong of the broadcast and media centres. The temporary venues in between have largely now been removed, not just the buildings but also the asphalted walkways and the paths and soft landscaping. It is all railings, cones and hazard lights now. Initially, it feels like the end of something. You have to remind yourself that it is actually a new beginning. This site is having a makeover, a £300m re-invention. Just as during games construction, it is planned meticulously, and there are serious deadlines. The London Legacy Development Corporation is overseeing the transformation, focusing firmly on July this year when the phased re-opening of the North Park should begin. We now know the stadium will see live sport again at the end of that month, with the London Grand Prix meeting confirmed for the 27th. It is not just sport either. The Hard Rock Calling and Wireless festivals are moving from Hyde Park to Queen Elizabeth Olympic Park this summer too. The Aquatic Centre has now been stripped of its extra seating, and the wrap removed from the outside of the temporary steel structure, so the wind is howling in the open sides. Only when the surplus steel has all gone will Zaha Hadid's vision finally emerge from its ugly games time cocoon. The wall-to-ceiling glass panels will go in by next spring ready for a re-opening and its legacy life as a combined elite and community facility. There will be no silly waterslides, but there will be the cachet of leaping in where Phelps and co dived. Let us hope they have got the heating back on by then; bitter is the only way to describe the water's current coldness. The temporary pools around it, including the Water Polo arena, are being dismantled and will be found new homes. The Orbit, love it or hate it, appears unchanged, but the concourse around it and the nearby stadium is being altered. This South Park Hub area with its cafe, restaurant and roof terrace will join up with the "South Plaza", a landscaped, tree-lined boulevard, which will stretch up towards the Velodrome. We are promised a series of outdoor rooms, fountains, climbable walls and giant swings. It will be planted with more than 4,000 trees and a million bulbs, providing a waterfront area for Stratford. From a distance, not much has changed outside the Copper Box, home of handball and goalball at the Games and it stays as a multi-purpose sports and entertainment venue, pretty much as it is. It will be hosting the London Badminton Grand Prix later this year and will be home to the London Lions basketball team. The Basketball Arena is still in place, albeit with its seats removed, half of which are being reinstalled at the Eton Manor Centre. Always a temporary structure, it is up for sale, after apparent interest from Rio came to nothing. If no buyer is found for the complete structure, all its plastic and steel skeleton will be recycled. The Velodrome, eerily silent, compared to the tumultuous din of competition is at the heart of what the LLDC claim will become the best cycling facility in Europe, with its associated BMX track and new mountain bike and road circuits. It is due to be re-opened early in 2014, and managed by the Lee Valley Regional Park Authority. Hopefully they will have flattened out some of the notorious bends at the BMX circuit before the public flood in, or they will need an ambulance on permanent standby. As for the Eton Manor site, that will be re-opened in 2014 as the Lee Valley Hockey and Tennis centre. Top-class sport is assured, with the 2015 European Hockey Championships already in the bag. So what of the big picture for the main stadium? Tough negotiations continue with West Ham's owners over the details that will, with agreement, make the park the club's new home from 2016. We're not there yet, and the LLDC has a deadline looming, at the end of February, to commit to being a 2015 Rugby World Cup venue. That won't happen if the West Ham deal's done, but if it can't be sealed, it might. Negotiating positions must surely have been played out, perhaps it's time for an ultimatum? What next for the Olympic Park? Read more on What next for the Olympic Park?